I do about 80% of my shopping for new threads and fashion related goods online. It's no real surprise that collectively we're increasingly looking offshore to get inspired and tempted to get out the credit card. Going online opens up the world and provides you with access to more labels and fashion houses that you've never heard of or get stocked locally in New Zealand. Now don't get me wrong, I love to support local retailers and if there's something I can grab locally, I totally will. But more often than not it's about finding some gems that no one else has or getting a direct feed on upcoming trends, and to do this - you've gotta jump online and get your hands dirty. The main issue here in New Zealand is we are fairly limited in the number of retailers that do men's fashion well. I'm referring to stores that pitch themselves a few notches higher than streetwear which is very much saturated. There's only a handful of retailers that serve mid-range fashion for guys (think Barkers & Country Road) and then there's even less in the boutique space (like Edit store, Fabric & Superette). So then where's the best places to go online for on-trend men's fashion threads I hear you say? No fear, I've compiled my top 10 sites that'll be your new best friend for getting all your swish new gear. Matches Fashion is one of my top 3 regular sites that I shop. It houses most of the brands I'm into like A.P.C. Nike, Calvin Klein, Illesteva, & Common Projects to name drop a few. The site is a breeze to navigate with its clean and simple user face and you'll easily end up coming across some awesome stuff by just browsing. Next thing you know there's five things in your cart. Shieeeeet. Matches Fashion also put a particular emphasis on keeping up with industry news and have a regular style report which covers topics such as how to wear items, grooming tips and interviews with those in the fashion industry. It's something to read up on if you're interested in how to learn more about style in general. A quick tip on this site is to make sure you set your local currency and location to NZ as the site will conveniently display local prices making it easier to weigh up your purchasing decisions. If you're lucky you might even hit the jackpot with free delivery which is the code 'FREESHIP' and so as it happens is currently active right now. Saves you $25 and the shipping is lightning fast, within three days from the UK. Another staple site I frequent and similar in proposition to Matches is End Clothing a site basically dedicated to men's fashion - a rare trait these days. It's a gold mine of awesome threads from labels you'll recognise and volumes of new ones. I'll often come here to find anything from some streetwear to more luxe items. End is also well known for having a massive collection of new season footwear particularly across labels such as Nike and Adidas. End Clothing has probably one of the most on point ranges of menswear that I've come across and there's a good price scale that should cater for any budget. I'm also constantly impressed with their sales, often seeing some things I've had my eye on, get discounted. So if you do see an item or two, or three, that feel a little out of your reach, wait and check back as you may get yourself a steal at some stage. End also host exclusive launches with various labels like Nike & Adidas so you can get your hands on some limited edition goods or be the first to access new releases. Definitely add End Clothing to your favourites bar, as you'll be coming here often. Far Fetch has an accolade of designers under its domain. From fashion-forward powerhouses such as Gucci, Burberry and Comme De Garcons for those with a particular taste for high fashion, to contemporary labels more in line with my personal taste (and budget) like A.P.C., Norse Projects, Naked & Famous and Zanerobe. As you may have guessed, many of the clothes and accessories here are fairly pricey if you're snooping around the high-end designer section, but if you do hunt around you can find some key items like a good pair of jeans or shoes that can work for your budget. Again with sites like FF, who house volumes of labels and collections you'd be smart to sign up to their newsletter and check back when they've got sales on big ticket items. There's nothing like getting a good deal on the big labels. Love me a bargain. East Dane is the mens answer to the leading women's online retail destination Shopbop. It's owned by goliath Amazon.com so it's a slick service that includes free 3-day shipping worldwide. Gotta love that super quick shipping! You can expect to find plenty of new threads you'll want to add to your wishlist on this site, which boasts a massive line up of labels and designers. Some of my favourites include Marc Jacobs, AMI, Native Youth, Rag & Bone and ETQ. While browsing the site you'll come across a lot of clothing and designs that you've never see here in New Zealand and if the price is right I encourage you to think about branching out. Don't always play it safe with the white tee, fashion is meant to be fun and creative. Think about how you could get something a little more unique and distinctive and make it an element of your personal style. 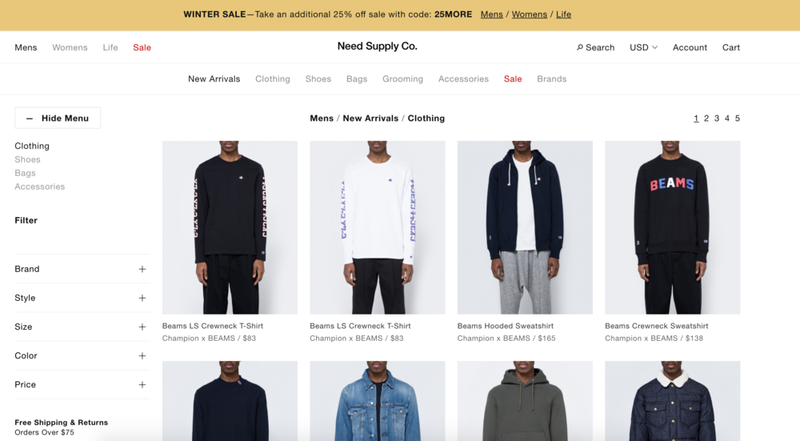 I think many of you are going to really like Grailed. It's a fashion trading platform that launched in 2015 that's been labelled the hip version of eBay. It's designed to be a community marketplace for those who appreciate good quality menswear from streetwear to luxury. Cleverly, the site is categorised into three sections to allows users to search for the right type of fashion they're after. Grailed is for those who follow and love high fashion menswear labels. Hype is for higher end streetwear labels and Basics for any casual essentials. One major difference with Grailed compared to something like TradeMe is you don't bid on the items, you simply hit purchase if the price is right for you or you can haggle and offer a lower price. Grailed has really taken the peer-to-peer fashion business by storm and it's quite fascinating as it's helping to make second-hand clothing cool again. Another bonus, is you can search for treasures right here in NZ and across the ditch too. I bet you haven't even read this far and you're already hitting purchase on something freaking cool. Mr Porter is probably one of the most infamous online style destinations for guys and there's every chance you've maybe heard of it but never shopped from them. It's time to change this. 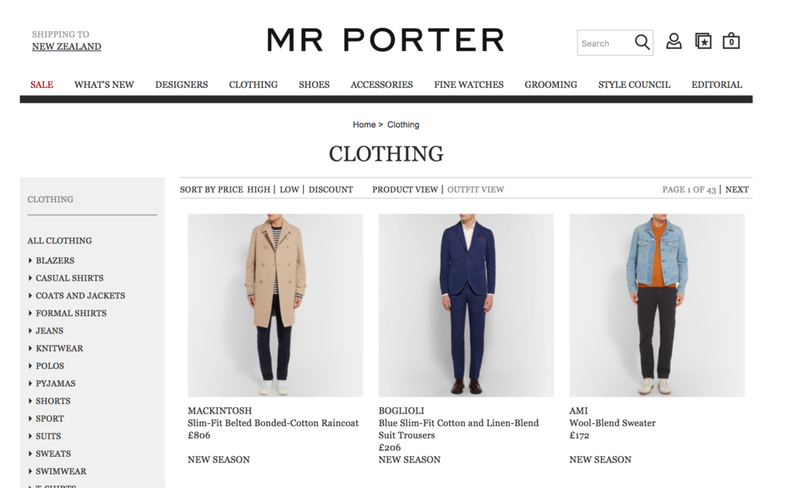 Mr Porter, the brother to Net-A-Porter (the shopping heaven for chicks) is home to not only one of the slickest line up of brands, but the biggest too with over 300 on their guest list. Highlights include Acne Studios, Ralph Lauren, Common Projects & Nudie Jeans. A feature I really appreciate from Mr Porter is their wealth of knowledge and content on their YouTube channel which I highly recommend checking out. They cover everything from how to keep your sneakers clean, style advice to segments that take a closer look at brands and collections. To top it off MP offer free express shipping worldwide, plus free returns (DHL pick up the parcel and send back) and they drop new products every Tuesday and Thursday. Do we really need any more reasons to spend our money?! Revolve Man is one of the hottest destinations for men's fashion, and I I've got to admit I'm a regular repeat offender. If you're in need of some inspiration, then go direct to their Hit List curated by the team at RM. Even our local label I Love Ugly feature as well as Aussie label Zanerobe. RM are working hard to have their finger on the pulse and have got style covered from the streets upwards. And if you're anything like me your style isn't set in stone or in one segment of fashion, it's a mix and always moving. This place has a good fruit salad of brands, labels, clothing and price points so one to add to your favourites toolbar. 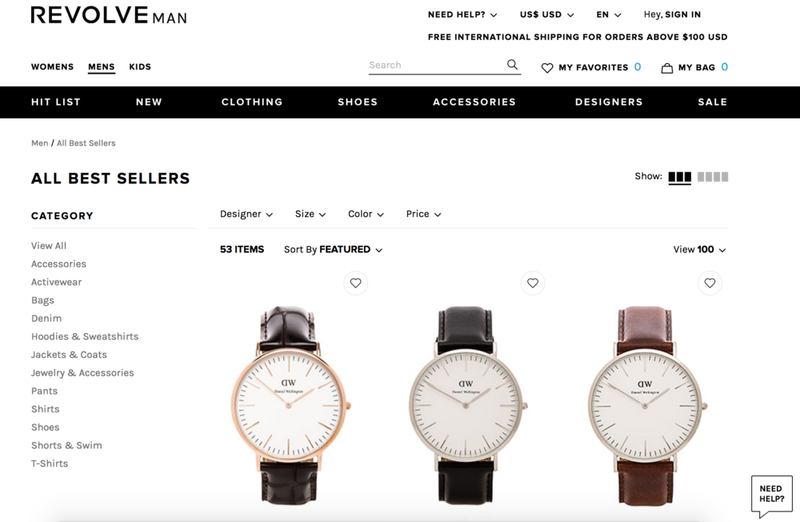 You can get an easy 10% off your first purchase when you sign up to Revolve Man. Best hop on and get to it then. SSENSE is the home of luxury fashion. Big names and some fairly big price tags can be found there too. But you know that's the price of high fashion. SSENSE is where you'll find a couple of really good statement pieces that'll last you for years so will pay back ten fold on a substantial monetary investment upfront. I'm a big fan of men's wallets and I'm excited by this line-up they're showcasing at the moment. Need Supply is an online retailer with the drive to provide people with the brands they love. I personally love the items they select to showcase and the brands they stock. Need Supply seem to hit the sweet spot of luxe men's clothing and it's a good place to start if you're keen to refresh your wardrobe without the heavy price tags that can come with some of the other high fashion sites. They've currently got 25% off their Winter range. Perfect time to get a head start for the new upcoming season (and you'll be in all the latest trendy wears too). Very Goods is an exciting proposition that was born out of eBay shutting down Svpply (which it purchased two years earlier) - its predecessor. Very Goods works by a way of collaborators like you and me curating our favourite things in fashion - a bit like painting your own shop window front. It's like Pinterest with transactional capabilities. See what you like, click and purchase. Very Goods are still in the early phases of developing their new and fresh platform (original Svpply designer at the helm) and membership will be open shortly so you can curate your own space. Sign up to stay informed when membership opens. There you have it, that's the round up of my favourite shopping destinations online, from Grailed where you can hunt for pre-loved clothing, Very Goods where you can shop curated favourites by fellow fashion enthusiasts, to big online retailers like Matches Fashion and Mr Porter for statement pieces. If you're on the lookout for something particular, like a new pair of jeans or a jacket I'd recommend stopping by a few of these sites to compare what's on offer, if you're patient and do a little digging you'll find some excellent threads.